Object detection and segmentation is the most important and challenging fundamental task of computer vision. It is a critical part in many applications such as image search, scene understanding, etc. However it is still an open problem due to the variety and complexity of object classes and backgrounds. 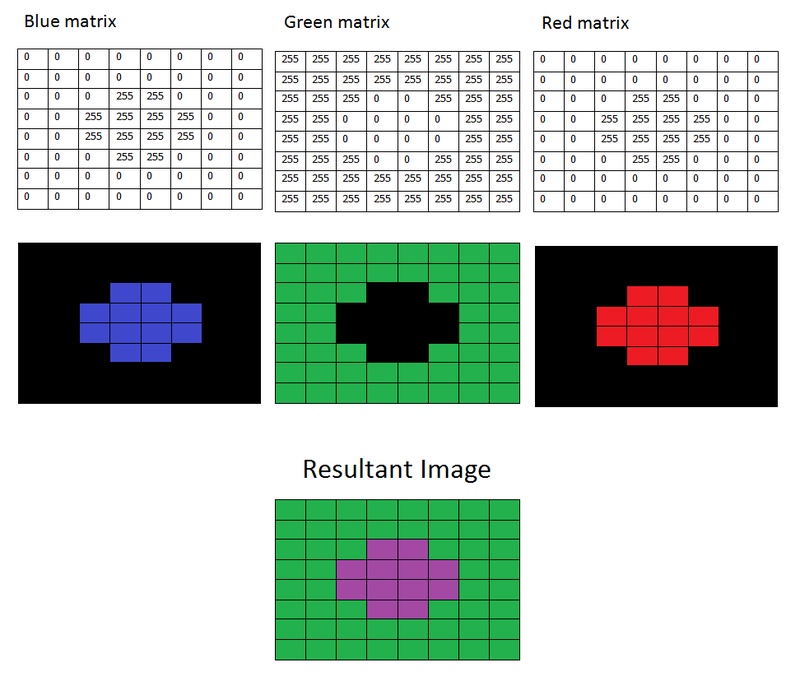 The easiest way to detect and segment an object from an image is the color based methods . The object and the background should have a significant color difference in order to successfully segment objects using color based methods. namedWindow("Control", CV_WINDOW_AUTOSIZE); //create a window called "Control"
OpenCV usually captures images and videos in 8-bit, unsigned integer, BGR format. In other words, captured images can be considered as 3 matrices; BLUE, GREEN and RED (hence the name BGR) with integer values ranges from 0 to 255. The following image shows how a color image is represented using 3 matrices. In the above image, each small box represents a pixel of the image. In real images, these pixels are so small that human eye cannot differentiate. Usually, one can think that BGR color space is more suitable for color based segmentation. But HSV color space is the most suitable color space for color based image segmentation. So, in the above application, I have converted the color space of original image of the video from BGR to HSV image. HSV color space is also consists of 3 matrices, HUE, SATURATION and VALUE. In OpenCV, value range for HUE, SATURATION and VALUE are respectively 0-179, 0-255 and 0-255. HUE represents the color, SATURATION represents the amount to which that respective color is mixed with white and VALUE represents the amount to which that respective color is mixed with black. In the above application, I have considered that the red object has HUE, SATURATION and VALUE in between 170-180, 160-255, 60-255 respectively. Here the HUE is unique for that specific color distribution of that object. But SATURATION and VALUE may be vary according to the lighting condition of that environment. These are approximate values. You have to find the exact range of HUE values according to the color of the object. I found that the range of 170-179 is perfect for the range of hue values of my object. The SATURATION and VALUE is depend on the lighting condition of the environment as well as the surface of the object. How to find the exact range of HUE, SATURATION and VALUE for a object is discussed later in this post. After thresholding the image, you'll see small white isolated objects here and there. It may be because of noises in the image or the actual small objects which have the same color as our main object. These unnecessary small white patches can be eliminated by applying morphological opening. Morphological opening can be achieved by a erosion, followed by the dilation with the same structuring element. Thresholded image may also have small white holes in the main objects here and there. It may be because of noises in the image. These unnecessary small holes in the main object can be eliminated by applying morphological closing. Morphological closing can be achieved by a dilation, followed by the erosion with the same structuring element. Now let's discuss new OpenCV methods in the above application. This function erode the source image and stores the result in the destination image. In-place processing is supported. (which means you can use the same variable for the source and destination image). If the source image is multi-channel, all channels are processed independently and the result is stored in the destination image as separate channels. This function dilate the source image and stores the result in the destination image. In-place processing is supported. (which means you can use the same variable for the source and destination image). If the source image is multi-channel, all channels are processed independently and the result is stored in the destination image as separate channels. int dstCn - Number of channels in the destination image. If it is 0, number of channels is derived automatically from the source image and the color conversion code. All other OpenCV methods in the above application have been discussed in early OpenCV tutorials. 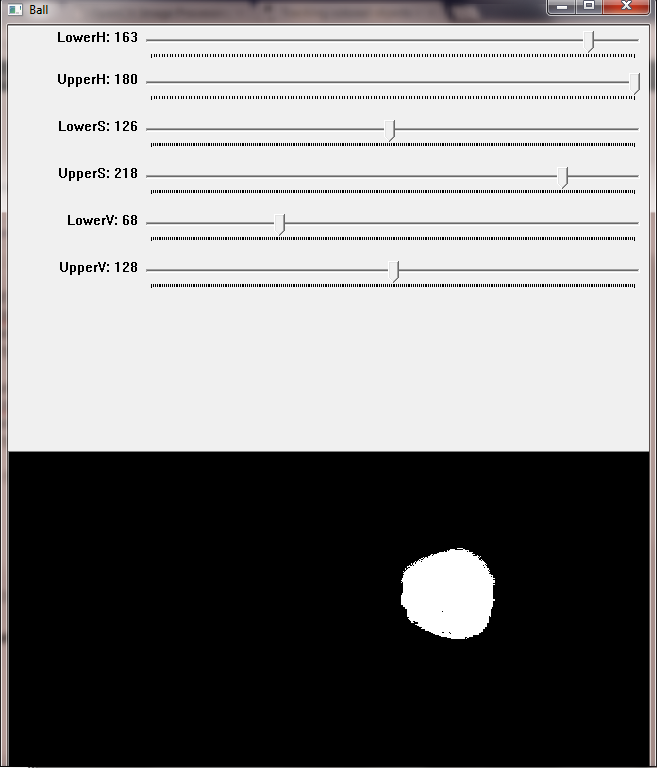 In the previous example, I showed you how to detect a color object. In the following example, I'll show you how to track a color object. There are 3 steps involving to achieve this task. 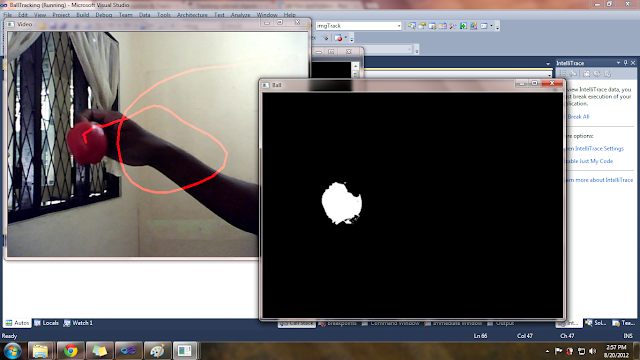 Here is how it is done with OpenCV / C++. In this application, I use moments to calculate the position of the center of the object. We have to calculate 1st order spatial moments around x-axis and y-axis and the 0th order central moments of the binary image. 0th order central moments of the binary image is equal to the white area of the image in pixels. If there are 2 or more objects in the image, we cannot use this method. And noise of the binary image is also should be at minimum level to get accurate results. In the above application, I considered that if the white area of the binary image is less than or equal to 10000 pixels, there are no objects in the image because my object is expected to have an area more than 10000 pixels. Now, let's discuss new OpenCV methods that can be found in the above application. This OpenCV function calculates all of the spatial moments up to the third order and returns a Moments object with the results. bool binaryImage - If this is true, all non zero pixels are considered as ones when calculating moments. This function returns a black image (with pixels with zero values) with a given size and type. Finding the optimum HUE, SATURATION and VALUE ranges for an object is a 4 step process. Track bars should be placed in a separate window so that ranges for HUE, SATURATION and VALUE can be adjusted. And set the initial ranges for HUE, SATURATION and VALUE as 0-179, 0-255 and 0-255 respectively. So, we will see a complete white image in the 'Control' window. First, adjust 'LowH' and 'HighH' track bars so that the gap between 'LowH' and 'HighH' is minimized. Here you have to be careful that white area in 'Ball' window that represents the object should not be affected, while you are trying to minimize the gap. Now you can find the optimum HUE, SATURATION and VALUE ranges for the object. It is 163-179, 126-217 and 68-127 in my case as you can see in the below picture. how can we hide the webcam feed from output and detection still work ? Actually from many days I am trying to know about Color Detection & Object Tracking. The tricks shown here really a good and important tutorial for me. Thanks man to let me read and know the issues. only one question, this is c or c++?, and which one have better performance in tracking objects? This is C++. Performance wise C might be slightly better. But OpenCV has more support for C++ API. Therefore it's better to go with C++. Hello! Can you remake the program so that the detection is done not by a line, but by a circle (a rectangle). Also, that the program could track these objects with the help of Arduino. Awesome work, well written, explanation of function used, thank you for this post! Could you please clarify your question more? You can detect a coin or any other object from an image in the same way if the color of the object is different from the background. It was an awesome video thank you very much for making such a important video like this. And I have another problem, when I trying to make this code for detecting blue colour, the code will recognize blue colour and also it detect red colour as well. You have any idea about the reason for that? That means you haven't chose the upperH and lowerH correctly. Try increasing the lowerH or decreasing the upperH. You may threshold the original image twice to detect the position of red and blue object separately. In real world practical color tracking, how do you account for the color change due to illumination ? one single color thresholding probably isn't robust enough ? 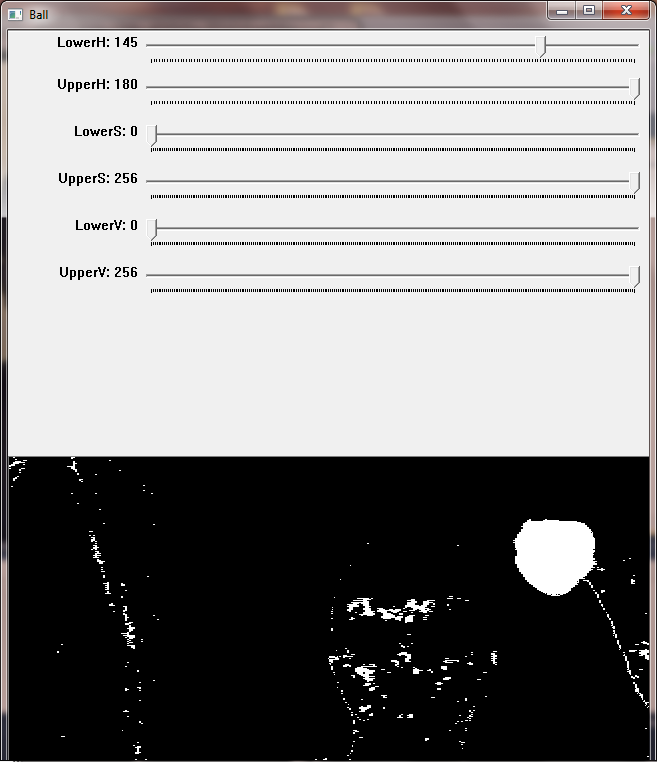 OpenCV_HSV -> Hue is from 0 to 179. Wiki_HSV -> Hue is from 0 to 360 (https://en.wikipedia.org/wiki/HSL_and_HSV). Would be possible to track and analyze reciprocal positions of different tracked objects? What about durability and feasibility of the system? I found your work very interesting, thank you for sharing. I would like to track a small black dot on some white paper that rotates to see how much off center the dot is. I assume that is no problem using your program. But how about logging the values ? Can I log at 10 Hz or perhaps 30 Hz if the camera is 30 fps ? I'm a freshman in open CV, and thanks for what you have done. I want to down the C project, but your click is invalid. Thank you again. The hue values of basic colors are EXACTLY what I was looking for! For some reason no other tutorial has it. Thank you so much! !